Derek Barker, Ph.D., is a program officer at the Kettering Foundation. Barker, whose background is in political theory, works primarily on research concerning the democratic role of higher education institutions, philanthropy and nonprofit organizations, journalism, and the professions. Derek’s previous experience includes an appointment as visiting assistant professor of political studies at Pitzer College. 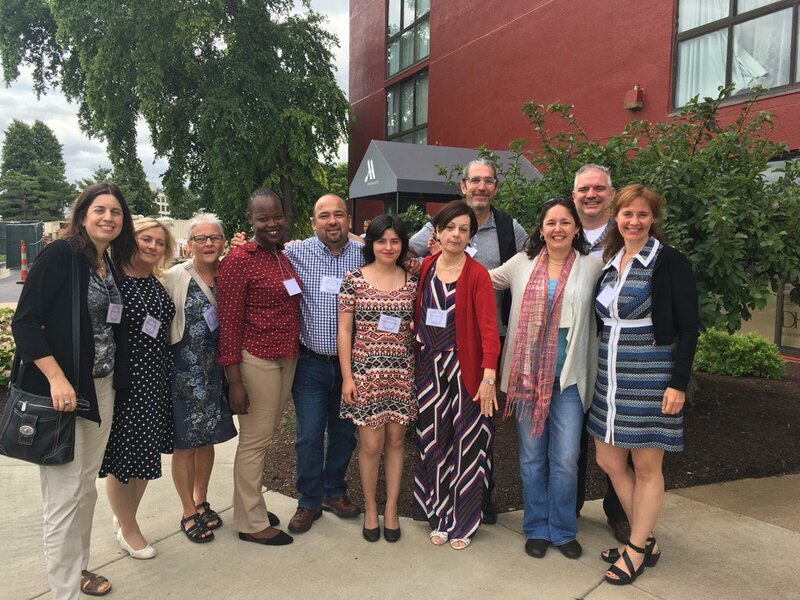 Martín Carcasson, Ph.D., trains students and community members to work as impartial facilitators with local governments and community organizations to analyze tough issues and then design, facilitate, and report on innovative public forums on those issues. Carcasson, a full professor in the Communications Studies department at Colorado State University, founded the university’s Center for Public Deliberation, which aims to enhance local democracy in Northern Colorado through better communication and collaborative decision-making. Margaret Fraser, has worked in the housing and community service sectors for more than 25 years. She is a graduate of Glasgow University with postgraduate experience in Housing Studies and a degree in Community Development. She has worked in partnership with the university for several years, supporting and inspiring community activists by way of the Activate Program. Telma Gimenez, Ph.D., is interested in developing understandings of democracy and the role of higher education institutions in creating active citizens. She supervises research on professional development in communities of practice, global citizenship, and language teaching at University of East London. Past projects include a study at Lancaster University exploring teachers’ beliefs about language learning and developing postdoctoral studies at the Institute of Education, UCL, London. Gabriela Gonzalez, a 22-year-old student at Universidad Austral de Chile, is interested in technological solutions for social problems. Gonzalez is working on a project regarding web apps to support rural high school teachers in mathematics. The mother of one is a teaching assistant on a mobile learning research project and has presented her research throughout Latin America and Europe. Lorlene Hoyt, Ph.D., is a researcher, teacher, and practitioner, seeking to understand why, and influence how, “rooted” institutions work together to improve the economic and social dimensions of the neighborhoods in which they are located. Hoyt is the Interim Executive Director of the Talloires Network and Associate Research Professor in the Department of Urban and Environmental Policy and Planning at Tufts University. Hlekani Muchazotida Kabiti was a pioneering leader and sitting Chairperson of the Amplifying Community Voices Students Association, which prepares students to contribute to community-engaged scholarship for rural development. She holds a Bachelor’s degree in Argibusiness Management from the University of Venda (South Africa) where she is completing her Master’s degree in Agricultural Economics. Ernesto Benavides Ornelas has designed myriad programs and courses dedicated to civic engagement, community service, citizenship education, and university social responsibility. He has been the Director of Social and Citizenship Education of Tecnológico de Monterrey in Mexico since 1998 and is a Ph.D. candidate for Social Anthropology at the Universidad de Salamanca, in Spain, where he also obtained the Advance Studies Diploma in Social Anthropology. Idit Manosevitch, Ph.D., has researched how different forms of communication and media can enhance the democratic ideals of informed, inclusive, and respectful public debate. Recently, Manosevitch has been working with the Kettering Foundation on applied research projects regarding deliberative pedagogy, particularly in higher education settings. She is an assistant professor in the School of Communication at Netanya Academic College in Israel. Carol Ma is the Associate Director at the Office of Service-Learning and Adjunct Assistant Professor at the Department of Sociology and Social Policy at Lingnan University, Hong Kong. Internationally, Ma has been awarded fellowships to participate in research at UCLA and the University of Manchester, and has established or served on the board of directors of numerous service learning and engagement initiatives, including the Service Learning Asia Network (SLAN), the International Center for Service Learning in Teachers Education, and the International Association for Research on Service Learning and Community Engagement. Currently, she is leading different projects in Asia, including the Cross-Border Service-Learning Summer Institute and the 1st project focus on Promoting Service-Learning in China. Helen Martin spent many years as a community activist before she returned to higher education to earn degrees at the University of Glasgow. She now teaches Community Development there and is Programme Coordinator for Activate, which introduces people to community development practice for activists and volunteers. Martin is passionate about working alongside those who strive for social justice and equity. Ronald Sistek is a facilitator and consultant who focuses on adult transformative learning, management for regenerative projects, systems ecology, and community building. The father of four has a Master’s degree in Development and Project Management in Real Estate from the University of Chile and a degree in Construction Engineering at the Catholic University of Chile. Shauna Sylvester is one of Canada’s leading engagement specialists. She strives to bring together diverse groups to address pressing social and environmental issues and has advised governmental and international agencies on such topics. She is a Professor of Professional Practice in the Faculty of Arts and Social Sciences at Simon Fraser University, the Director of the SFU Centre for Dialogue, and the Executive Director of the SFU Public Square, which focuses on the university’s community engagement.